Rabbi Shlomo Farhi: Director of Aish UK's Schools Division. Rabbi Raphy Garson: Rav of Ohr Yisrael Synagogue, Elstree. Rabbi Jeremy Golker: Director of Kodesh, Hasmonean Girls School. Rabbi Yaakov Hamer: Rav of Finchley Central Synagogue, London; Director of Shaarei Orah Institute. Rabbi Ilan Halberstadt: Educator in Hendon, London; son-in-law of Rabbi Dr. Akiva Tatz. Rabbi Yehoshua Hartman: Rosh Beis HaMedrash, Hasmonean High School, London; author of multi-volume Machon Yerushalayim edition of the Maharal of Prague's works. Rabbi Malcolm Herman: Associate National Director at seed, UK. Rabbi Aubrey Hersh: Senior Lecturer at the JLE, London; experienced historic European tour guide. 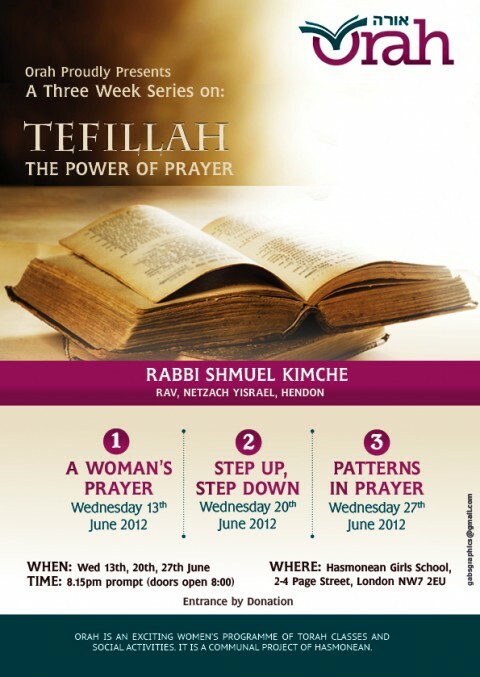 Rabbi Shmuel Kimche: Rav of Netzach Yisrael, Hendon; Director of Ezra Youth Movement, UK. Osher Chaim Levene: Founder and Director of Orah; author of Jewish Wisdom in the Numbers (ArtScroll: 2013) and other works. Rabbi Yehoshua Posen: Dayan on the Golders Green Beis Din; accredited Commercial Mediator specialising in monetary matters. Rabbi Meir Rapoport: Rav of Imrei Shefer, Golders Green, London. Rabbi Dovid Roberts: Rav of Kehillas Netzach Yisroel, Edgware. 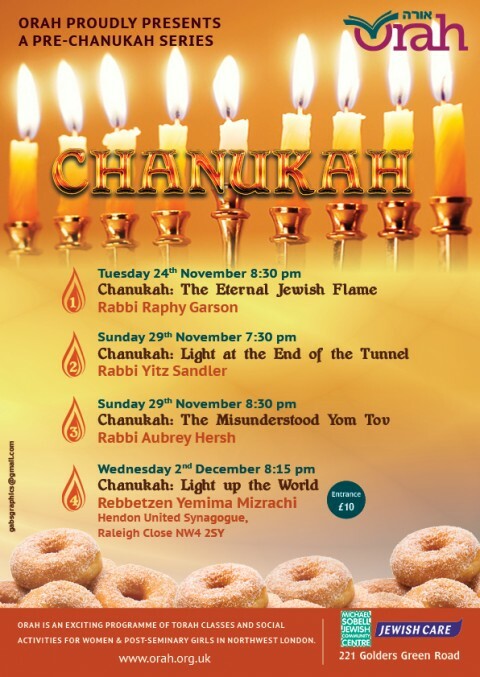 Rabbi Yonoson Roodyn: London-based rabbi at Aish UK. Rabbi Daniel Rowe: Education Director at Aish UK. Rabbi Yitz Sandler: Formerly Director of Education at Aish South Africa and Director of Development at Aish UK, Edgware. Rabbi Shimshon Silkin: Rav of Beis Yisrael, Borehamwood. Rabbi Dovid Tugendhaft: Rav of Nishmas Yisrael, Hendon. Thank you for this special programme! What really is so nice about Orah is that there was such a range of women all learning together. 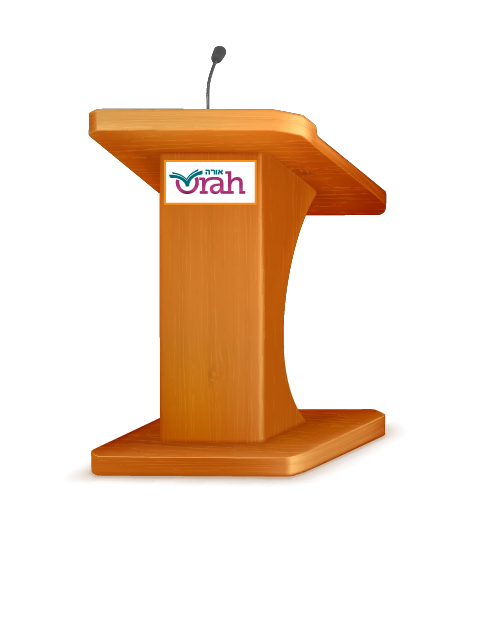 Looking at the forthcoming Orah schedule, we're definitely in for a very exciting winter!